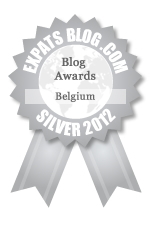 ExpatsBlog.com Expat Blog Awards 2012: Belgium Silver Award! This blog won the Silver Award for best expat blog in Belgium! Cheeseweb is a fantastic resource whether you are looking for a nice restaurant in town, a destination for a weekend trip or simply a beautiful, warm and personal view of the country. Cheeseweb is the best!!! Great photos and great content, always up to date!!! If you are looking for a blog filled with content you can really use, then Cheeseweb is an absolute most! Their professional and style keep me coming back for more. So enjoyable to read with tons of great information to help you learn more about Belgium and beyond. A real award winner! LOVE Cheeseweb! Always giving me ideas on what to see and do next! What a wonderful resource! On expat life, on Brussels, on travel. The images are glorious, the writing is direct and fluid. So happy to have found this wonderful blog. Cheeseweb is fantastic! if you're looking for a place to go, something to do or something great to eat, you can always find it on Cheeseweb. I love that blog, it's very interesting and entertaining to read, even for a belgian native ! CheeseWeb is such a fantastic source of information, about both Belgium and a number of other amazing travel destinations. I'm constantly recommending the site to friends who are visiting an array of locations, because CheeseWeb always seems to have helpful tips. Cheeseweb is a fantastic blog for expats and others who love travel, good food, photography and adventures! I really like that they have visited so many of Belgium's and other close by destinations with great suggestions to help us get to know the country better. Thanks Cheeseweb! If you are a soon-to-be expat/immigrant/trailing spouse who wants to know what Belgium is like, Cheeseweb.eu is the go-to source for all things Belgian. It takes you on a ride of emotional ups and downs of being in Belgium, gives you insights into living here and finally escaping from it. Everything you would ever want to know about Belgium is here, with great reviews of restaurants and casual dining. Wonderful little side trips to interesting little places and great big events. Entertaining and informative. Perfect! Cheeseweb is a great resource for expats, as well as anyone travelling in Belgium and beyond.Tons of information on things to see and do, where and what to eat,as well as tips to help you make the most of your stay. I particularly enjoy the lovely photos of beautiful gardens,charming villages, and mouthwatering dishes.Wonderful! It's the only Belgium Blog I read and it's lured me there three times already! Seriously, it has some of the best info that you could hope to get about a whole variety of subjects such as food, travel, food, events, food, attractions, food and of course wine. What else is there? Generously and creatively sharing the expat life and inspiring adventuring throughout Belgium and beyond. Beautiful and delightful. I just have enjoyed the great photos shared in this website. Pretty helful website when it comes to visit restaurants, places and more. Photos are outstanding as well. Fun blog with good ideas for things to see and do in Belgium. I really enjoy the pictures, whih are excellent. Thanks for being a guide and inspriation during my first year in Belgium. I have picked up many ideas for travel, dining and outings. Your older posts on life in Brussels have let me know that I am not alone. Great site! CheeseWeb is a great resource for things to do in Belgium and beyond. Unlike a lot of websites it is not focused on a single city and encourages me to get out and visit the less known locations. Love the pictures and the enthusiasm for Belgium! Great resource filled with anecdotes, pictures and positive enthusiasm. Very usable, enjoyable, informative, & helpful! CheeseWeb is my go-to resource for all things in Belgium and beyond: restaurants, activities, advice, travel destinations, etc. The passion behind the stories comes through with every post and the photography is wonderful. Love it! Although I am not an expat myself, I still follow this blog with great interest. The articles posted cover a variety of subjects and one is never bored reading! Such an informative blog not only for the expats in Belgium but also for the residents of this country. Congratulations! An interesting blog with a variety of subjects about Belgium...Good luck! !